Tradition is great in Alsace, much stronger than the commercialism, opportunism and short-sightedness. Therefore, many producers cultivate "lesser" grapes in the best locations. Grand Cru Zinnkoepflé is ideal for the Sylvaner, and is highly valued in the twin villages Westhalten and Soultzmatt, which together with Mittelbergheim and some villages in northern Alsace (Westhoffen and Bergbieten) give great Sylvaner, by any standards. 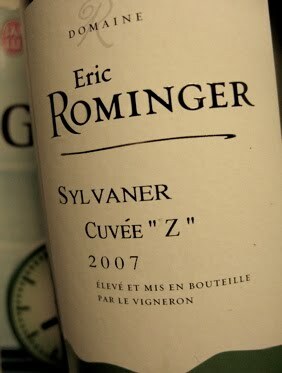 2007 Sylvaner Cuvée "Z" has a dense but quite restrained aroma of peach, pineapple and wet wool. The taste is fruity, quite dry, medium-bodied with a typical bitterness in the long aftertaste. Price: € 11.